Many high school seniors will have to select a college by Monday, and with "Decision Day" approaching, a Virginia teacher is expecting a new wardrobe of sweatshirts. 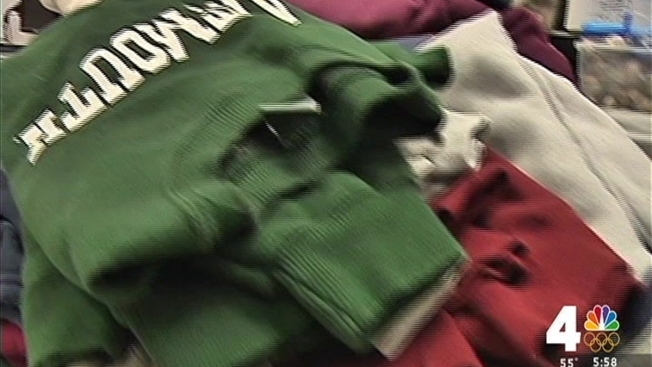 Denise Wingfield, a biology teacher at Dominion High School in Sterling, Virginia, collects sweatshirts from the colleges her students attend. She has amassed at least 60 sweatshirts so far, and they each remind her of a student. "They’re memories, they’re memories of kids. I have 20 years' worth of kids in this room," the Loudoun County teacher said as she browsed stacks of folded sweatshirts. Wingfield began to receive the sweatshirts years ago. "It started off as kind of a thank-you to her," said fellow teacher Emmy Joseph, who is a former student of Wingfield. “Once you’re one of her kids, you’re one of her kids. And you’ll be one of her kids even when you’re her colleague. I’m still one of her kids," Joseph said. Wingfield also keeps a "hall of fame" list, writing on a whiteboard where every student will attend college. “They know that I’ve got something that will remind me of them," she said.